Fabergé, legendary jeweller to the Russian Imperial court, introduces Karenina – a capsule collection of sublimely crafted designs inspired by the heroine of Leo Tolstoy’s masterpiece, Anna Karenina. Opulent 19th century St Petersburg was the backdrop for the lives of these two artistic geniuses and the setting for their greatest works. It was only a few years after Anna Karenina was published that Peter Carl Fabergé became Imperial Jeweller to the Tsars, creating his extraordinary and celebrated Fabergé Eggs. The Karenina fine jewellery collection echoes the exuberance and romance of this era whilst celebrating the heroine’s femininity with contemporary style. 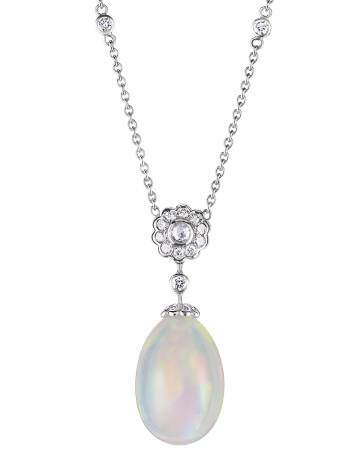 An opal pendant, suspended from a white gold chain is at the heart of the collection, embellished with delicate diamond clusters encircling a magnificent rose-cut diamond. Translucent white opal earrings complement the set, evoking the soft colours of moonlight and the shimmering satin gowns worn at the grand balls. This elegant set of matching pendant necklace and earrings is also available with precious Akoya pearls or with spectacular emeralds, instead of opals.